Seahawks mailbag: Tag and trade Earl Thomas? Why does Russell Wilson get sacked so much? Could the Seahawks still get anything in exchange for Earl Thomas? And why does Russell Wilson keep getting sacked so much? That and more in our latest Seahawks mailbag. It’s time for another Seahawks mailbag, where we answer your offseason questions. Question: Would it be beneficial to place the franchise tag on safety Earl Thomas and then negotiate a trade (for 2019 draft picks!) with the likes of Kansas City or Dallas, instead of letting him walk without any return? I guess you run the risk that you can’t get a trade done and you are stuck with an unhappy player on a bloated, one-year deal. One of best players at free safety plays for the Seahawks, but they can’t agree on his value, and they would get neither his play nor his value in a trade. Signed, a Seahawk in 9er Land. Answer: It’s an intriguing thought, but I think you sort of answered your question. I think it would be difficult to get much for Thomas in that scenario, when a team would be potentially taking him on just a one-year rental and potentially having to do so while paying a salary that would likely be around $12 million in 2019 (tag numbers haven’t been set, but the number for a safety last year was $11.287 million. Thomas made $10 million a year on his old Seattle deal). Not only is the tag number a guaranteed salary, but all of it also goes onto that year’s salary cap. Since you mentioned the Cowboys, last year’s tag number would give Thomas the fourth-highest cap number of any player on the Dallas roster in 2019. Would they want to accept that plus then give Seattle a whole lot for Thomas? Sure, a team such as Dallas could trade for Thomas and then work out its own deal for him. But Thomas likely wouldn’t want less than the tag number, and teams might decide they could just wait another year for him to become a free agent and get him cheaper then. You also run the risk of not being able to trade him and then having him for another season at a salary the Seahawks obviously don’t want to pay — if they’d been willing to pay him $12 million or more a season, this probably would not have gotten to this point. The team could get something for him even if he signs elsewhere as an unrestricted free agent in the form of a compensatory draft choice. There’s no guarantee of that, of course, and as we saw last year, the Seahawks could negate their free-agent losses with their own free-agent signing, making this moot. Still, it’s an option. And you can use the tag only once per season, and I think Seattle will more likely want to have the tag available for defensive end Frank Clark. The Seahawks have made it pretty clear they intend to keep Clark around, and a long-term deal is undoubtedly Clark’s preferred option. The Seahawks, though, might be willing, if not eager, to use the tag this year on Clark to assure he stays in the fold for 2019 and buy more time to work out a long-term deal. So, I’m not sure I see a tag-and-trade scenario in play with Thomas, who appears headed to free agency. What's Seattle's biggest defensive need? Everyone says DE, but I think LB and S were bigger weaknesses this year. A: The Seahawks need help at defensive end, even if they keep Clark. Pass rush is just so important, and Clark and Jarran Reed are Seattle’s only linemen who have shown they can provide it on a consistent basis. I’d agree that linebacker and safety need help, too, but in much more specific areas. Seattle has as good as it gets at middle linebacker with Bobby Wagner. But the other two spots remain in question, as K.J. Wright is likely to hit free agency, meaning Seattle could be looking for other options at weakside linebacker (Mychal Kendricks maybe, depending on how his sentencing unfolds? Austin Calitro? Shaquem Griffin? A free agent?). At strongside linebacker, there’s no guarantee Barkevious Mingo will be back — the team could save $3.3 million against the cap if he’s released (while taking a $1.1 million dead-cap hit). Either way, he hardly seems a long-term option there, though maybe Jacob Martin is. In fact, my hunch is the Seahawks consider Martin as a viable long-term candidate for the SLB spot, and I’d doubt they’d devote a ton of draft or free-agent resources to that spot this season, depending on what happens with Mingo. The WLB position is another matter. If Wright doesn’t return and if Kendricks is not available, the Seahawks might need to make a significant move there. As for safety, Seattle got good play this year out of Bradley McDougald, who has two years remaining on his contract. And I think the Seahawks believe they got better play out of Tedric Thompson and Delano Hill this year than fans might, especially considering each being in his second NFL season and what was his first playing substantially. I think the Seahawks are more than willing to consider Thompson and Hill as potential safeties of the future. From a cap and overall return on investment standpoint, the best thing that can happen is that Hill and Thompson turn out to be the players the Seahawks hoped. That said, knowing that Thomas won’t return means Seattle simply needs to add some numbers at safety, and I could see Seattle adding a free agent as well as one through the draft/undrafted free agency who could be a contender to make the roster. But I think the Seahawks are content to go into next year thinking McDougald/Thompson/Hill can be their trio. But the moves the team makes this offseason will speak loudest on that front. Coach Pete Carroll often has expressed confidence in Thompson and Hill. Whether that’s just talk will be proven over the next few months. How do you see Seattle acquiring more picks, in the draft, by just trading down? Or do you think we may trade a couple players, to get picks? A: That’s a good question. I’m not sure Seattle has a ton of vets who would yield a lot in a trade, other than guys you wouldn’t want to trade such as Bobby Wagner or Russell Wilson. There might be a few guys who would merit late-round draft choices, and I’m sure the Seahawks would consider that, especially because by that time they’ll also be through free agency, when maybe they have acquired a player at a position that makes someone else more expendable. But the most likely route remains trading down. Seattle has the 21st overall choice. We saw the Seahawks take the 26th pick and acquire four additional choices by merely moving down nine spots in 2017. I think that’s what they are more likely to try to do again, though some mix of both might be the best way to go. Hawks had 20% more sacks last year than the previous year. Are they ever going to protect Wilson? A: As a refresher of what the questioner is asking about, Russell Wilson was sacked a career-high 51 times in 2018 after being sacked 43 times in 2017, despite far more pass attempts. Wilson threw a career-high 553 times in 2017 and 427 times in 2018, fewest since 2013. But sacks are a more nuanced issue than just saying the line is to blame. The Seahawks unquestionably got off to a bad start in the pass-protection department against some good rushers (Von Miller, Khalil Mack) and before they had their preferred starting five healthy and playing together. In the games Seattle had its preferred starting five of Duane Brown, J.R. Sweezy, Justin Britt, D.J. Fluker and Germain Ifedi, sack numbers were generally much better — Wilson was sacked two or fewer times in a span of seven out of 11 games from the third game of the season to the 12th. That’s when Fluker got hurt again, in the first game against the 49ers, which started a string of injuries across the line that also saw Ifedi and Sweezy miss at least one game in the final month. Predictably, the sack numbers picked up again, including six in the season finale against Arizona when Seattle had just two of its starting five linemen playing in their regular spots. So, players matter. When they had their best players out there, Seattle’s line played much better than when it didn’t. But Wilson is the one who has the ball, and Carroll noted on more than a few occasions there were times when Wilson could have helped the issue by getting rid of the ball more quickly. Some sacks also are due to Carroll’s philosophy. You might have noticed that one of his pet saying is that “It’s all about the ball” in stressing the importance of gaining turnovers while losing as few as possible. Seattle was great at that in 2018 with a team-record low 11 turnovers as well as an NFL-best plus-15 turnover margin (for all the time spent trying to figure out why Seattle was better this year than people thought, start there). A big reason for the lack of turnovers was Wilson throwing a career-low-tying seven interceptions. And a big reason for THAT is Wilson at times takes sacks instead of throwing the ball up for grabs, which is what Carroll would prefer. 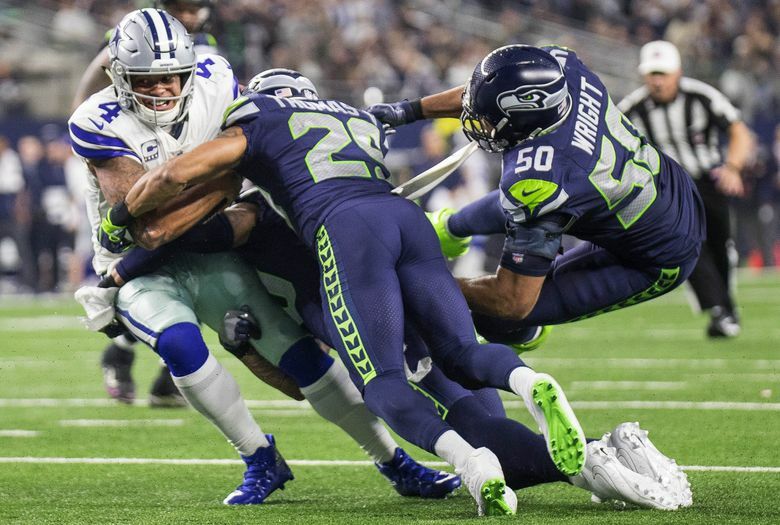 Especially on third down, Carroll would rather Wilson eat the ball and play the punt-and-field-position game (which was more true than ever this year with the kind of season Michael Dickson had) than risk an interception. True, Wilson had one really notable pick on a pass thrown up for grabs against the Vikings. But in a way, the fact that he had so few such plays this year made those ones stand out. Three of Wilson’s picks came in fourth-quarter desperation situations when it was obvious he was willing to take more chances. He probably could have had fewer sacks had he been willing to risk a few more interceptions. But he knows which side of that trade-off Carroll prefers.